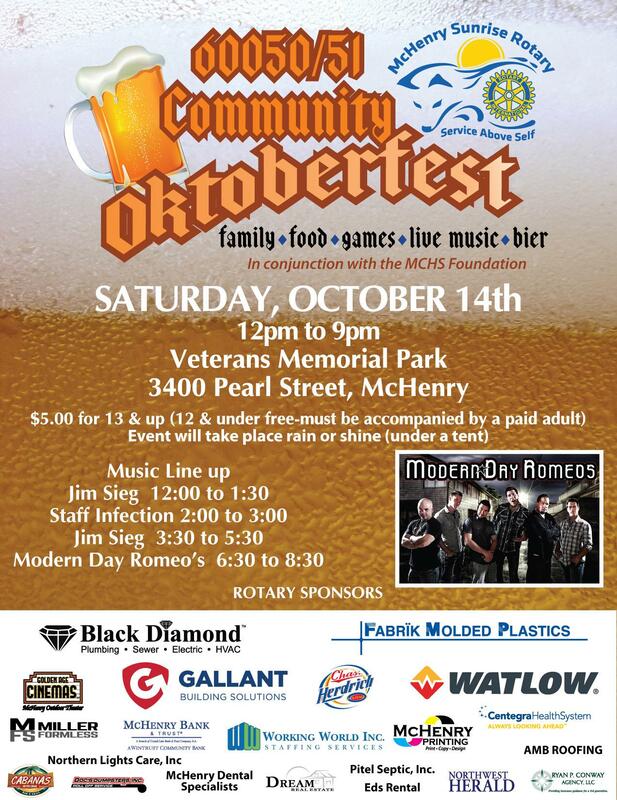 Rick Miller with Phoenix 24/7 Towing has stepped up as this years McHenry Sunrise Rotary Oktoberfest naming sponsor. We are thrilled that Rick stepped up this year. Rick has been a big sponsor for a few years and even handled the parking for us last year. Phoenix will be in charge of the parking again this year. Rick helps with many community groups and is a huge asset to our community. If you ever need a tow please give Rick Miller and his crew a call. (815) 728-7112 They will not let you down. Thanks Rick! Anne Hughes joined us from the Rotary Club of Woodstock. She shared with us an international service project that her club is working on, along with other partners. McHenry Sunrise Rotary promotes and coordinates toy delivery to families in need during the Christmas season. On Wednesday, June 27th, 2018 the McHenry Sunrise Rotary Club set sail for a 2 hour tour. This was our bi-annual “Changing of the Guard” boat trip and dinner. During this event our Club recognized the outstanding service of various members. 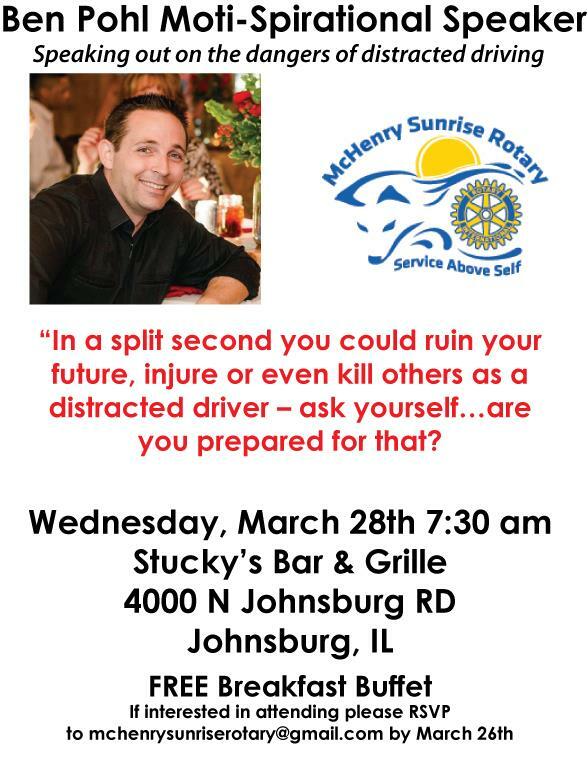 The McHenry Sunrise Rotary Club invites you to our morning meeting on Wednesday, March 28th at 7:30 am at Stucky's Bar and Grill. Located at 4000 N Johnsburg Rd, Johnsburg, IL. Our guest speaker for the day is Ben Pohl. Ben will be speaking about the dangers of Distracted Driving. Come hear his story and enjoy a FREE breakfast buffet on us. Why do people join Rotary? 1. Friendship / Fellowship / Community: In an increasingly complex world, Rotary provides one of the most basic human needs: the need for friendship and fellowship. It is one of two reasons whyRotarybegan in 1905.
other and collectively help others. Many families in McHenry County are desperately struggling due to unexpected job loss, death of a wage earner, divorce or abandonment, illness, disability or other crises. Children in these families might not otherwise experience the joy of a gift to unwrap on Christmas. Last year we helped over 2000 kids have a nice Christmas. This week we will sort, wrap and deliver over 8,000 toys to 2200 plus children in McHenry county. This is accomplished with the help of 300+ community volunteers. We are working hard on our 60050/51 Community Oktoberfest. We hope you will join us for this great event . Great music, delicious food, and a tasty beverage or two will guarantee a good time. Oct 14th Noon to 9pm. Watch for our ads and invite your friends. February 17th 2017 National Random Acts of Kindness Day. Happy 2017 & Sunrise Secret Santa Wrap-up! Happy New Year, everyone! 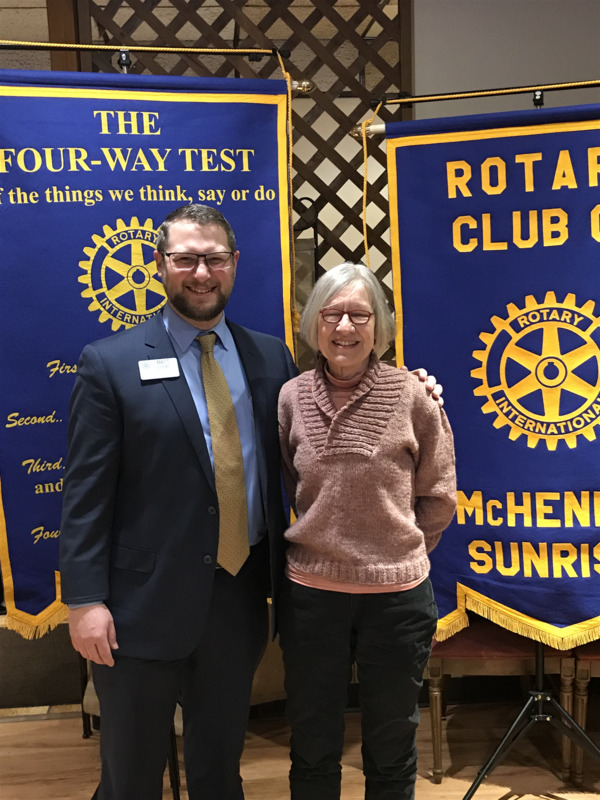 The Rotary Club of McHenry Sunrise is off to a great start in 2017 and we hope that you are too. As a club, we're looking forward to growing our membership, events, fundraising, and impact on the community. We have high hopes for 2017 and we want you to be a part of that growth. If you have ever wanted to give back to your community but were unsure how to make that happen, please contact us! The opportunities to get involved are everywhere and they range from donations, to volunteering, to sponsorship, and even just supporting community service through word of mouth; it all has the positive impact of us building a better community together! Your 2017 resolution to be more involved in the community is ready to be crossed off the list... reach out and join us for a complimentary breakfast, Wednesday morning's at 7:30am! The numbers are in for the 2016 Sunrise Secret Santa and the work that our community has done for each other is incredible! 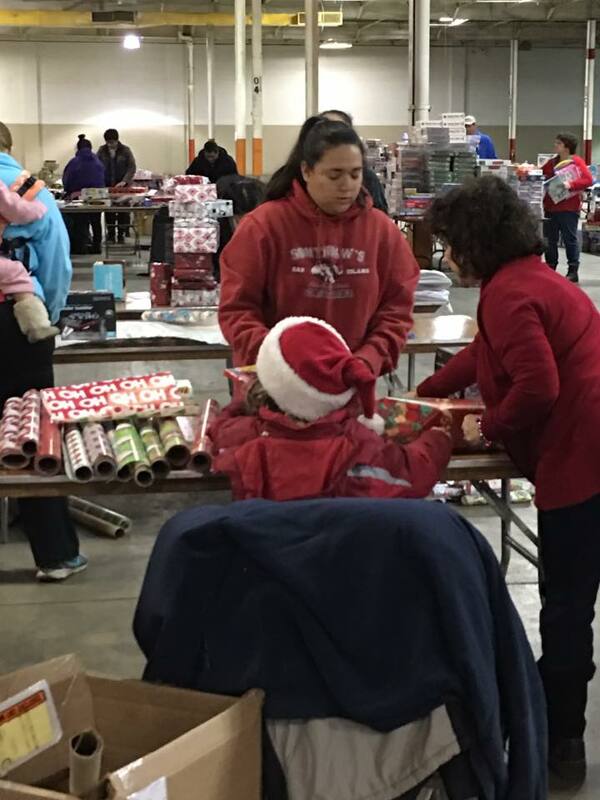 During the week of December 12th through December 18th, we had the help of approximately 300 volunteers who put in over 1,000 volunteer hours in order to make sure Christmas was not overlooked for kids in need. 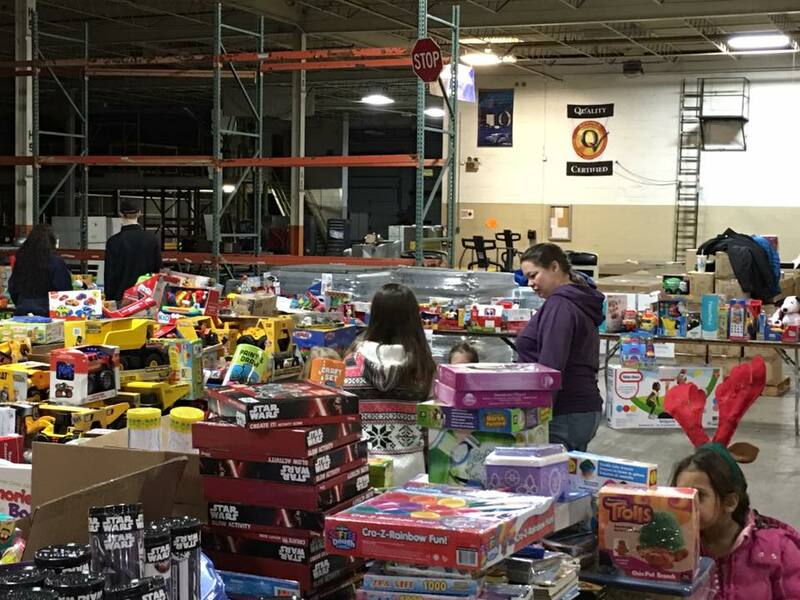 We collected over 11,000 total toys; our volunteers wrapped and delivered nearly 8,000 of those toys to 2,052 kids in 785 families all across McHenry County, and 3,000 toys were delivered to Arden Shore! The spirit of the season is truly alive in McHenry as we came together to all be "Santa". A massive THANK YOU goes out to the volunteers and all of our sponsors (Working World, McHenry Outdoor, Crystal Lake Bank & Trust, Black Diamond, Dream Real Estate, Worldwide Traveler, Chas Herdrich, McHenry Financial, Land Technology, Chain O'Lakes Brewing, and Cabana's on the Chain)! Also thank you to BrakeParts for use of their facility! A new president in charge and great 1st speaker for the year. 2016 Changing of the guard boat trip on the Fox river. 2nd annual Changing of the guard boat trip on the Fox river. Two great presentations on Wednesday. Tom Geraci from District 156 and Joe Starzynski from Woodstock Rotary. Tom was here to share McHenry District 156’s transition program. He helps student from 18 to 22. He helps these students develop independent living and job skills. He works with local businesses to find jobs for these students. He is looking for speakers from local businesses to come in and speak to the students about what they do. He has these students go on field trips to learn about what that business does. He also has a train to hire program to make sure the student has the skills for that job. He is looking to meet with local businesses that may need employees. Joe came to talk about the foreign exchange students. He brought Vivie from Finland and Lisa from Sweden. They like the program and think it is great that they were part of Rotary. Joe is looking for clubs to host and the more clubs that hosts the more students we get to send. The meeting was called to order at 7:30 a.m. Present were Mike, Carl, Matt, Duane, Scott, Ryan, and Trista. July 30th - Annette Jahnell, "My Year of Beds"
Mike reported that we have four sponsors thus far. A few members are in discussions with other companies regarding additional sponsorships, so keep finding new ones. The Chamber is still looking for parade help this Sunday, July 20th. If you can volunteer, meet at Main Street Station at 11 a.m. on Sunday. Shawn has officially resigned his membership. Carl reported that the McHenry Community Fellowship Breakfast will be a free event with limited availability (tickets will be distributed) on Wednesday, 11/26, from 7:30 - 9 a.m. at the McHenry High School West Campus cafeteria. Since this event conflicts with our usual fourth-Wednesday fellowship breakfast at Brunch Cafe, we will relocate that month to this event instead. Carl also reported that the book drive will still occur later this year. Carl has been thinking about the idea of an annual literacy award through which one or more classroom teachers would be rewarded for their unique literacy efforts with a library purchased for their class. Scott recommended we reach out to Follett as a possible sponsor for this reward. Matt provided an Oktoberfest update. We currently have seven beer vendors with the intention to secure up to twelve vendors. We have three bands that will donate their services in lieu of tasting mugs. The VFW is secured as both the venue and the food provider. Mike found a mug that will work on which our logo can be printed. We will find inexpensive lanyards to affix to each mug. Mark will get an estimate on 50 T-shirts through a supplier he knows. Tickets sold will be limited to 300. Advertising for the event will begin in September. Businesses who would like to sponsor our club for the year and wish to be featured on advertising for this event must have their sponsorship payment submitted to the club by early August at the latest. If Route 120 construction is still in full swing by October 29th, our annual adopt-a-highway clean-up will cover from Green Street east over the bridge only. We should start taking pictures of the club president with our program presenters to submit to the Northwest Herald as news items. The marble game rolled over. The meeting adjourned at 8:30 a.m.
Well, my friends, it has been quite a year. Thank you for this token of it and for putting your faith in me to guide our club through it. I am happy to pass the torch to the very capable hands of Mike Lehman, who is this year's Rotarian of the Year and now Paul Harris Fellow. I also congratulate Georgene Hefner Sergeant as the now two-time recipient of the Chuck R. Peterson Service Award along with Mike's second place finish and Ryan Conway's third place finish in the Service Above Self Challenge. My husband Nick Iodice is also very grateful for your thoughtfulness in recognition of his assistance. Thanks to all who attended tonight's Installation Dinner as we look forward to what will surely be another successful Rotary year together. It's been awhile since we've updated our newsletter; so here's a general summary of what's gone on in our club since the end of May. Shelly asked for input on why we joined this club and whether we'd like anything different out of the meetings. The general consensus from those in attendance was that the day and time is fine; rather simply that there are times of the year that are more conducive to actual attendance than others. Jim Marinangel from McHenry Savings Bank gave a presentation on the Kiwanis Soap Box Derby that will be held on Waukegan Road on June 11th. He provided us with details of the event and explained that our club may want to consider sponsoring a car and driver. The meeting on 3/16 featured a Polio Plus presentation by PDG Dave Waring. This meeting covered St. Patrick's Day Parade and paper-goods-drive planning. This meeting was the February fellowship breakfast held at the Brunch Cafe. Sue Dobbe from Crystal Lake Dawnbreakers spoke about her club's upcoming charity auction event on March 5th. February 9th Rotary morning meeting: will be at Sage Cancer Center, which is at the west end of Centegra Hospital – McHenry. Easiest way to get there is to follow the road behind the hospital (which passes by the Emergency Department on the north side and Childtime Day Care on the south side) to the end across from the helicopter / Flight for Life. Tours will also be part of our time at Sage Cancer Center, and the tours wil be given by Amy Moerschbaecher, Executive Director of the Center. Denise Brausen is hosting this meeting. T Hephner and Dave Homan were inducted. Our official active member count stands at 28! Tour of Centegra Sage Cancer Center. Three prospective members attended: Dave Homan, Rebecca Stiemke, T Hepner. Wayne Jett was officially inducted. Terry Hargrove from the Noon club was also a guest today. Membership survey: members are comfortable meeting when we do and where we do; but are up for any changes that meet the club's long-term goals and don't raise our annual dues much if at all. Our December 22nd meeting will be our monthly fellowship breakfast at the Brunch Cafe at 7:30 a.m. We will not meet on December 29th due to the holidays and will resume meeting at the Shah Center on January 5th. Happy New Year! Thirteen members were in attendance at this meeting. American Community Bank to host Santa: Maureen Biederer announced Santa will be coming to the bank (on Route 31 in McHenry) on Saturday, 12/11, from 9:00 – 12 noon. Bring the kids and grandkids, and your camera. This Santa is the real deal! There will be cookies, apple cider and lots of fun. Come on out and start the holiday celebration! Please sign-up to help with the distribution. Trista suggested having about $25 available to make change should someone want to buy one of the extra wreaths that were ordered. Paul Harris Fellowship Presentation: Jeff Batt announced there are four (4) new Paul Harris Fellows for our club. Shelly Casella-Dercole received her award at this meeting, and the balance will be presented at the Club Assembly later this month. Congrats, Shelly! Jeff gave a brief overview about this award, noting Paul Harris started Rotary in Chicago in 1905. As Rotarians contribute into this foundation cause, which supports Rotary International (RI) efforts worldwide, our club becomes eligible to receive grants from RI. Recap of 2010: Jeff outlined the accomplishments of our club since its beginning stages in January of 2010. § January 17th – first meeting of 7 members with an idea of organizing a new club. § Five year goals were set: 50 active members, 12 service projects per year, and raise $100,000 for charity annually. § April 20th – received Charter from RI, noting we were one of the quickest clubs to receive charter from time of first organizational meeting. Going forward, the club will work to become a stronger club, driving towards our 5-year goals. Lively group this week reminding us of upcoming events, such as Wreath Distribution on Saturday, December 4th, from 9:00 to 12:00 noon. *** The McHenry Noon Club will host a poker tournament at the McHenry Moose Lodge on Friday, November 12th. Volunteers are welcome. The really cool Rotarians turned out for this meeting. Wait, I did make it this week? How coincidental! This meeting was our monthly fellowship meeting at the Brunch Cafe; so much of the meeting was spent getting to know each other better. 15 members in attendance, a guest, Nicole of Kumon, and our speaker, Father Jim Swarthout of St. Paul's Episcopal Church in McHenry. 10 members in attendance for the club assembly meeting, along with a guest: Curt Bremer of the McHenry Lions Club. Guest today was Lorraine Kopcyznski of the Rotary Club of McHenry (our sponsor).